ometimes, you just want a good basic biscuit — ham or sausage, maybe chicken. On those days, keep it simple. Seek out a spot where the parking lot is packed and where the staff knows everyone by order or name. After one visit, they’ll know you, too. 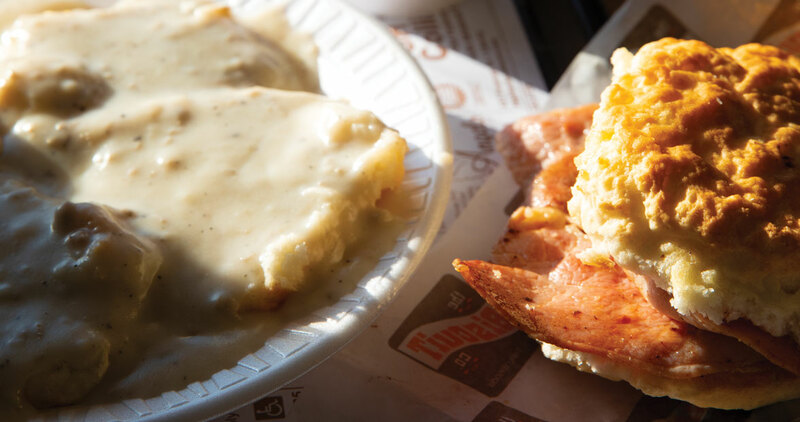 Besides locals, people on their way to the North Carolina Zoo stop at The Biscuit Company in Asheboro, where the hearty breakfasts include old-style biscuit options like fatback (try it with tomato) and bologna, in addition to classic sausage and ham. Gravy is available by the scoop and half-scoop. Biscuit King has been around for more than 20 years, offering meaty biscuit fillings — pork chop, steak, ham, and sausage. There are three locations around Lexington, and the company plans to open a store in High Point this year. Fried chicken biscuits have become a classic, and nobody does them like Sunrise Biscuit Kitchen in Chapel Hill. No matter how old you are, you can order a Bad Grampa: a fried boneless chicken breast on a biscuit, topped with an egg, cheese, and bacon, and served with hash browns and sweet tea. If you move away, don’t fret — they do mail orders for those who miss their drive-through biscuit fix.